Charter Buses: Where in the World Are They Going? Have you ever been out driving and spotted one of those big, sleek charter buses gliding along the highway and thought to yourself: Who’s behind those tinted panoramic windows? Where are they going? According to a 2012 survey by the American Bus Association (ABA), there are more than 3,600 motorcoach carriers in the United States, operating some 35,000 motorcoaches, providing 637,442,000 passenger trips per year. Half of those passengers are either students (24.1%) or senior citizens (26.1%). The other half? Business travelers, athletes, shoppers, party-goers, special interest groups ... and others. Read on to learn more. A “typical” carrier offers charter service, shuttles, group tours, and scheduled runs. So, when you spot a charter bus on the road, it could be going just about anywhere. It might be transporting second graders to the MSU Dairy Farm for their spring field trip … or local Red Hatters on their way to a matinee performance of “Pippin” . . . or a college swim team heading to Divisionals . . . or, for that matter, it could be taking a group of strangers to Greektown Casino for the day. School trips. Whether it’s a half-day field trip to a local museum or a three-day visit to Washington D.C., schools hire charter buses for all kinds of transportation needs. Youth group trips. Boy Scouts on their way to summer camp. Future Farmers of America heading to the national leadership conference. A church youth group going on a weekend retreat. What do these groups have in common? They all travel by charter bus! Office functions. Companies host summer picnics or staff retreats so coworkers can enjoy each other’s company away from the stress of the workplace. A charter bus is the perfect choice for these get-togethers, so that getting there can be part of the fun. Corporate travel. For sales meeting, conventions, and training events, more and more businesses are opting for the convenience, reliability, and cost-effectiveness of bus travel. Shopping excursions. Serious shoppers know that a day at a Premium Outlets mall, or Ikea, or [fill in the blank with your all-time favorite shopping venue] is SO much more than just shopping. It’s an event. They can’t be bothered with traffic, parking, and long walks to the visitors’ lot. But even more important: serious shoppers know that many of the best shopping venues offer discount vouchers, gifts, and free food to bus groups. How great is that? Team travel. High School, college, and professional sports teams typically take a bus every time they play away from home. (So do robotics and debate teams, for that matter.) 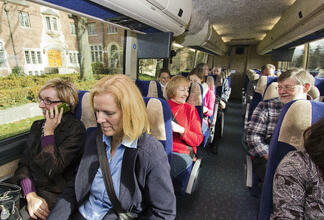 When safety and affordability are key, a bus is the best way to move a group. Casino runs. Lots of charter bus companies offer casino runs on a regular schedule. And casinos offer special packages for bus groups – like free or discounted food, slot vouchers, and players cards. Family reunions. For large family reunions, a charter bus is a great way to make sure everyone gets where they’re going, keep the group together, and enjoy each other’s company on the way. Families also like having transportation throughout the reunion for picnics in the park, sightseeing, and other group events. Weddings and other events. Charter buses are great for local travel whenever people have to travel from out of town, and/or where the ceremony and party(ies) take place in two or more separate locations. Think bar and bat mitzvahs, graduations, baptisms, and other group celebrations. Rock bands. Or film crews. Or touring theatre groups. You get the idea. When you have a lot of people, plus a lot of equipment, plus a lot of ground to cover, a charter bus makes a lot of sense. Tour groups. Tourists from out of town ride charter buses to visit monuments, museums, natural wonders, or other area points of interest. Next time you see one of those big, beautiful luxury motorcoaches gliding down the highway, try to guess where it’s headed. Better yet, book a motorcoach for your group, and see for yourself how affordable, convenient, luxurious, and fun it can be to get from here to there on a bus.